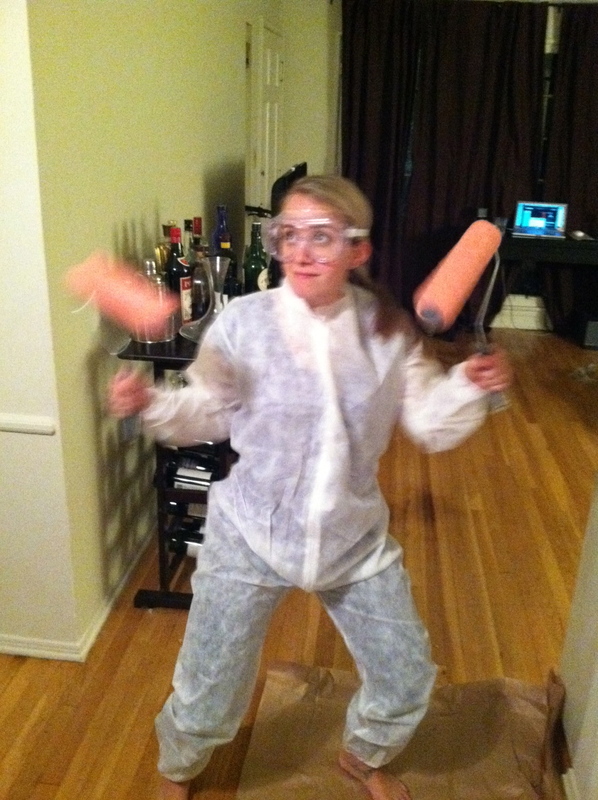 I think you know you love your apartment when you start painting. That is when you know you’re gonna be sticking around for a bit. Especially when you paint a room red. That’s commitment. Because, let’s face it, that’s never gonna get painted with enough coats to get it back to the boring white the rest of the apartment is. When you move out you have some serious work ahead of you. I guess I also know plenty of people who have painted their apartments because they DIDN’T love it. You know, to try to make it a bit more livable. Take my sister’s creepy senior year college house. A little bright green paint and some sweet curtains made that room awesome. And not creepy at all. Nice work, Nicki. But this apartment is different. I really, really love it. So yesterday I convinced Brad to go to the paint store with me and spend our night off together painting our dining room. We showed up at the paint store knowing we wanted red. And I insisted that we get a color with a food name. That’s a reasonable request for a chef and a foodie painting their dining room, right? 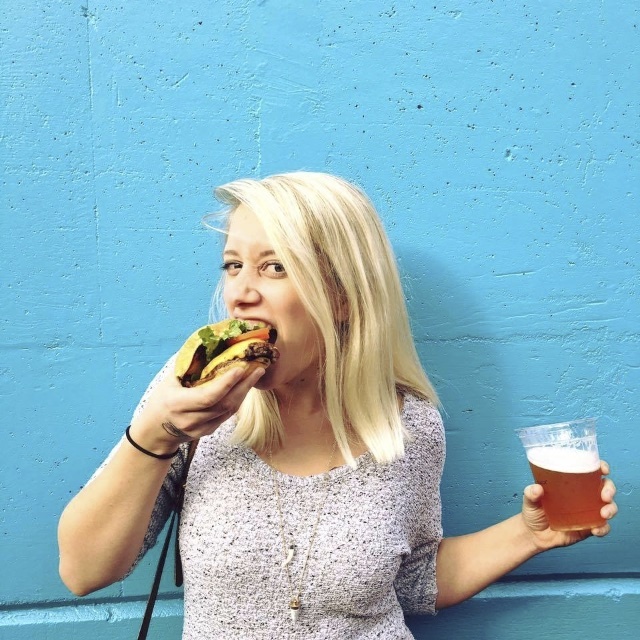 The red genre turned out to be full of foods. No problem here. Chili peppers, crabs, tomatoes, lobsters, beets, raspberries, apples… A lot of foods are red. We almost went “Rhubarb” until we found “Shy Cherry”. Who can resist Shy Cherry? 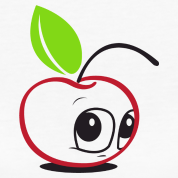 For some reason we Googled “Shy Cherry” and found this cute little shy guy. Shy Cherry was it. So we found our perfect food paint color and then let the guy mix it up. 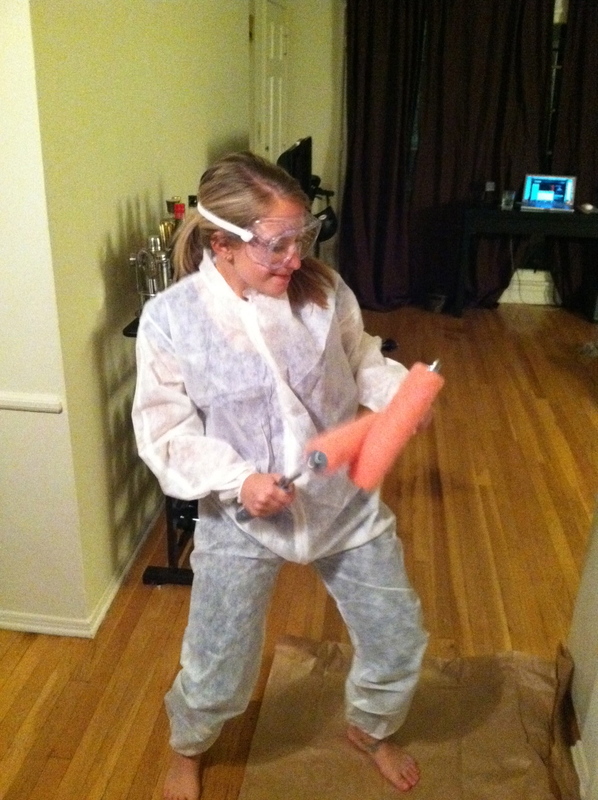 This is when I got a little silly. Don’t give me ten minutes to do nothing in a paint store. I’ve already gone through all the ridiculous paint names. Now I’m gonna move on to the hardware part of the store. Brushes, sponges, hats, sanders, and… painting suits. 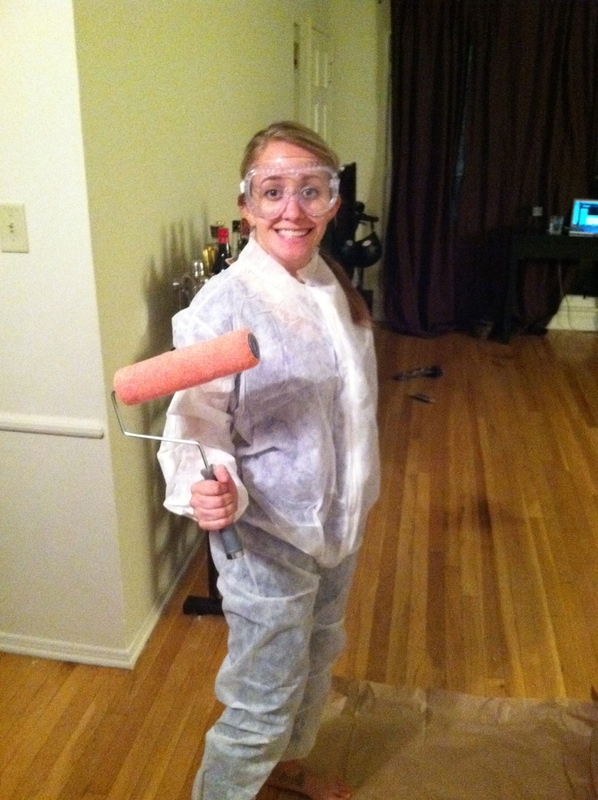 I found a very affordable painting outfit to ensure that I would be paint free at the end of our adventure as well as look incredible glamorous the entire time. And although Brad thought I was crazy, I knew looked great. It was a bit hard to smile with those googles on. Makes me feel for happy scientists. It can’t be easy to be them. Then, just for good measure, I tried out some dance moves. Most absolutely dance worthy. Best $8 I’ve ever spent. Oh, we did a little bit of painting, too. 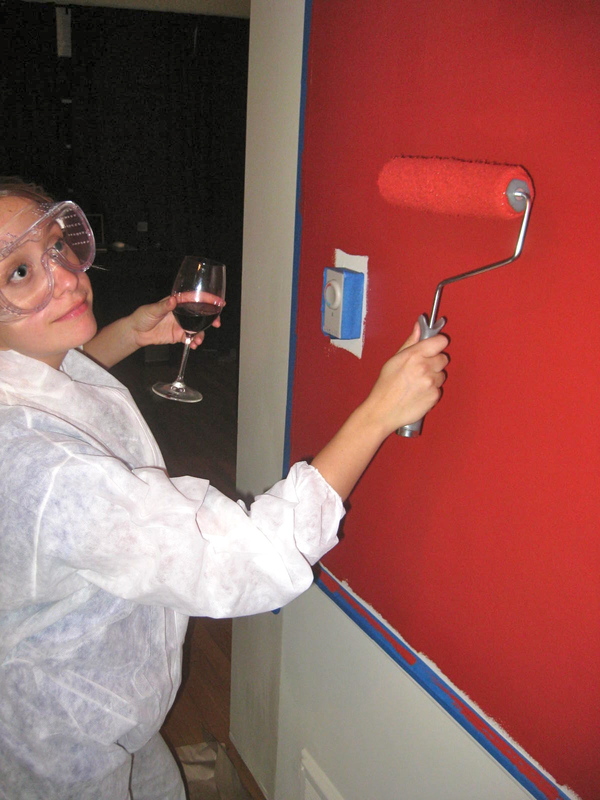 I even got fancy and paired my red paint with red wine. By the end of the night we had a dining room that is not shy at all. With only a few little mistakes that need covering up. And one trash bag full of red stained paper towels and floor coverings that only mildly made it look like we had just murdered someone in our apartment. 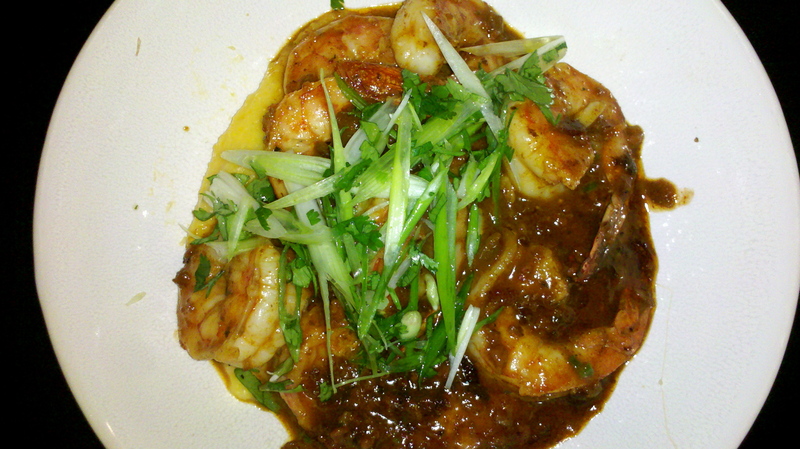 Oh, and because I love food and a girl’s gotta eat, Brad then made me the most amazing Shrimp and Grits EVER. With a chorizo sauce and cilantro. I make a mean Shrimp and Grits, and I will never make it again because now I know Brad’s is 658689680 times better than mine. Truth. 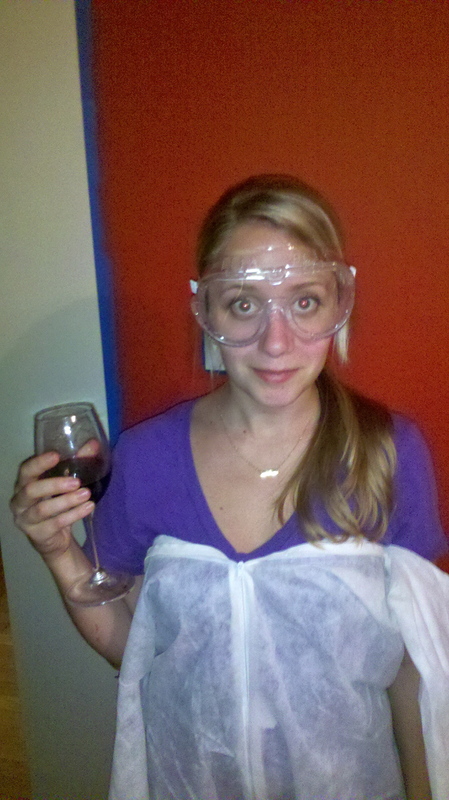 My contribution was whisking the Cheddar Cheese into the Grits, drinking more red wine, and wearing my paint outfit most of the rest of the night. I think I did a great job. 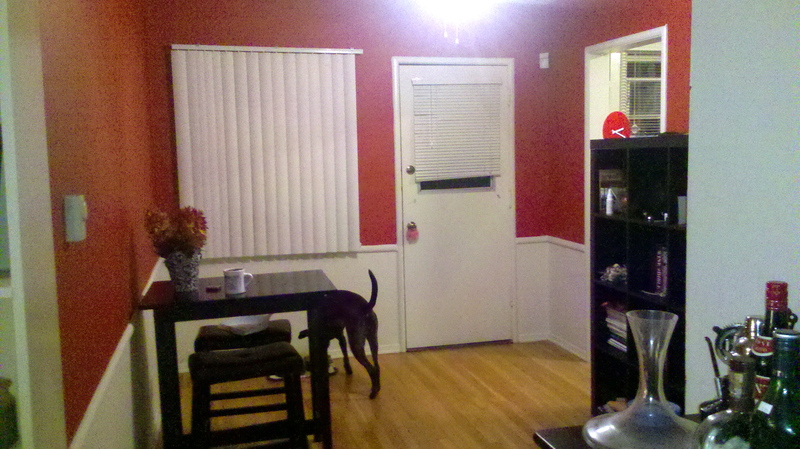 And our dining room looks incredible. Thanks, Shy Cherry. Happy Brad and Kelly day off! !